During the summer months, this Cheesy Vegetable Frittata is a frequent go-to staple for dinner, breakfast or any time we want a healthy meal fast. It is quick, easy and we can use up whatever vegetables we have on hand, which is especially convenient during the summer when we have an abundance of fresh summer produce…. This easy recipe for Baked Chicken Fajitas is filled with juicy seasoned chicken, crisp-tender vegetables, all made quick and easy in the oven. Thanks to Hunt’s® tomatoes for sponsoring this post. Baked Sweet and Sour Chicken is a healthy 30-minute meal made with chicken, lots of vegetables, and a light sweet and sour sauce. It takes just minutes to prepare, making this Baked Sweet and Sour Chicken an ideal weeknight meal that is much healthier than its take-out counterpart. Here the Baked Sweet and Sour Chicken is served over the ever trendy super-seed, quinoa. You can easily substitute brown rice, or another favorite grain, or eliminate it all together for a lower carb option. Preheat oven to 400 degrees. Spray 13x9-inch baking dish with nonstick cooking spray and set aside. In a medium bowl, whisk honey, ketchup, soy sauce, vinegar, ginger and 1 tablespoon water. Toss chicken in 3 tablespoons of honey mixture and place in prepared baking dish. Toss peppers, carrots and scallions in remaining honey mixture and pour evenly over chicken. Loosely cover baking dish with foil, leaving one end open to vent. Bake for 25 to 35 minutes, or until chicken is thoroughly cooked and vegetables are tender. Meanwhile, put quinoa and broth in a medium sauce pan. Bring to a boil over high heat. Then cover, reduce to a simmer (medium-low) for 15 minutes, or until liquid is absorbed and quinoa is tender. Season with salt and pepper, as desired. Divide quinoa on plates and spoon chicken and vegetables over quinoa. Buffalo Chicken Quinoa Salad is a delicious entree salad made with quinoa, broccoli, carrots, tossed with a healthier version of buffalo chicken. Quick and easy, perfect for a weeknight! This Buffalo Chicken Quinoa Salad is darn near perfection. We start with warm, shredded chicken tossed in a lighter buffalo sauce; add sautéed vegetables and combine it with the ever trendy (and tasty!) quinoa. Sprinkle blue cheese (or cheddar) on top, as desired, and you’re looking at a delicious and healthy Buffalo Chicken Quinoa Salad. Make quinoa: In a medium sauce pan, put rinsed quinoa and vegetable broth and bring to a boil. Cover and reduce heat to a simmer for 15 to 20 minutes. Let sit for 5 minutes and then fluff quinoa with a fork. Poach chicken: While the quinoa is cooking, place chicken in medium pot, and add enough water to cover chicken. Bring to a boil, cover and reduce to a simmer; cook for 5 minutes. Remove pan from heat and let chicken stand, covered until cooked through (about 12 to 14 minutes). Remove chicken from liquid and shred with 2 forks. While quinoa and chicken are cooking, sauté the vegetables. Spray a nonstick skillet with cooking spray and heat over medium high heat. Add broccoli, carrots and the whites of green onions, and sauté for 5 minutes, or until desired crisp-tenderness. Set aside. Make the sauce: Whisk together hot sauce, oil, lemon juice, garlic powder, paprika, onion powder and salt. Pour ¼ cup sauce over shredded chicken, tossing to coat. To a large bowl, add quinoa, chicken and vegetables, tossing to combine (You can add remaining sauce with this step OR drizzle as desired over each individual serving). Sprinkle with remaining chopped green onion and serve. I drew inspiration from this recipe and my Baked Buffalo Chicken Tenders recipe. Chipotle Macaroni and Cheese is a delicious, cheesy, veggie-filled baked pasta with a Mexican twist. It is made with three different cheeses (yum!) and lots of vegetables (yum!). The chipotle chiles add a nice smokiness and spice which, along with the chili powder, balance nicely with the tomatoes and cheeses. Black beans give a protein and fiber boost while adding a nice color contrast to the rest of the dish. A traditional breadcrumb topping is sprinkled over the top before baking. Chipotle Macaroni and Cheese is very easy to prepare and the result is no ordinary mac ‘n cheese, that’s for sure. This recipe makes plenty, and the leftovers heat up nicely for lunches the next day. Preheat oven to 350 degrees. Cook pasta according to package directions, omitting fat and salt. In a large pot, heat oil over medium high heat. Add chiles, onion, and bell pepper, and cook 4 minutes, or until onion is tender. Add garlic and cook 1 minute, or until garlic is fragrant, stirring frequently. Sprinkle with flour and chili powder, and cook 30 seconds, stirring constantly. Reduce heat to medium and add tomatoes. Cook for 3 minutes, or until mixture is thickened. Add adobo sauce, cheddar cheese, cottage cheese, milk, Parmesan and egg, stirring until combined and cheese is melted. Add cooked pasta and black beans, stirring until combined. Spray a 2-quart baking dish with cooking spray. Pour pasta mixture into prepared baking dish. Top with bread crumbs. Bake for 30 minutes or until bubbly. 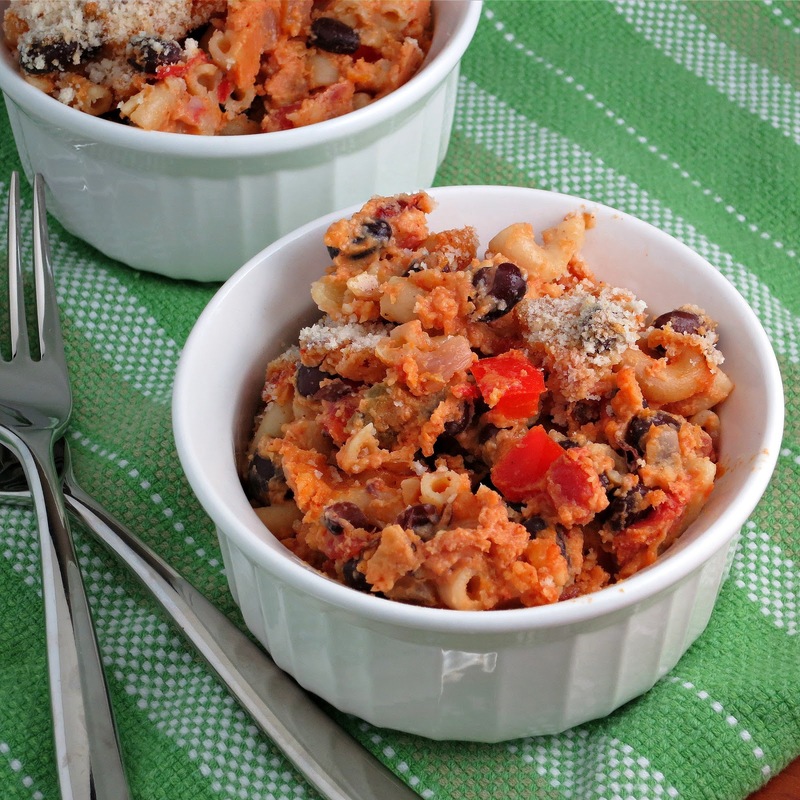 Lighter Cajun Chicken Pasta is a one-pot, easy recipe with a cajun twist made healthier! This Cajun Chicken Pasta is an easy, one-pot stovetop dinner made with lots of vegetables and spicy chicken in a creamy sauce. The hands-on cooking time is around 20 minutes, which means with a little advance prep (chopping vegetables and chicken), this can easily be a weeknight dinner, or a quick dinner any time. The recipe is also easily halved to make dinner for 2. I used this recipe from Southern Living for my inspiration, but made several modifications to lighten up the dish. For the cream sauce, I used fat free evaporated milk instead of half-and-half, and the result was great. It had a creamy texture without being heavy. I also eliminated the butter in favor of cooking spray and a small amount of olive oil for the vegetables. I reduced the amount of pasta and added more vegetables. There is a lot of flexibility with the vegetables to add more or change it up to use up what you have on hand. The result is a lighter version of Cajun Chicken Pasta that is simply delicious! Meanwhile, sprinkle chicken evenly with 1 tablespoon Cajun seasoning and salt. Spray a large saute pan with cooking spray and heat oven medium-high heat. Add chicken, and saute for 5 to 6 minutes or until done. Remove chicken to a plate, tented with foil. In the same saute pan, add olive oil and heat over medium heat. Add red onion, peppers, mushrooms and garlic to pan and saute for 9 to 10 minutes, or until vegetables are tender and liquid evaporates. Garnish with green onions, as desired, and serve immediately. Red-Leaf Salad with Roasted Sweet Potatoes is all things good wrapped up in a salad. You have your roasted sweet potatoes and red onion, green beans and pepitas, all on a bed of red leaf lettuce and topped with a tangy yogurt dressing. Sound good? Umm..yeah, I thought so too! Mike and I don’t typically put dressing on our salads, but the first thing that he commented about this dish was ‘how good is that dressing!’ The dressing has some zip, so a little goes a long way. It goes perfectly with the sweetness of the roasted sweet potato and onion. There are so many yummy vegetables in this dish, I would happily eat it every day of the week. I made a couple changes of note from the original recipe. First, I used nonfat Greek yogurt instead of low fat regular yogurt. The Greek yogurt adds a nice little protein boost, and frankly is what I always have on hand. I’m sure regular yogurt would work just fine. The other change I made was using pepitas, in lieu of walnuts, due to my tree nut allergy. Pepitas are always tasty and added a nice little crunch. However if you are a walnut fan, I suspect they would also be quite delicious in this dish. Frozen green beans worked really well, but I look forward to using fresh green beans when the season hits. Mike and I were talking in terms of ‘next time we have this’…which tells me there will definitely be a next time. This salad is a keeper! Preheat oven to 450 degrees. Line rimmed baking sheet with foil. Place sweet potato and onion on baking sheet and toss with olive oil. Roast until sweet potatoes are tender, approximately 30 minutes. Add green beans and pepitas and roast another 5 minutes. In a small bowl, whisk together yogurt, vinegar and garlic. Add salt and pepper to taste. Place lettuce on bowl and top with sweet potato mixture. Drizzle dressing on as desired and serve. We have had the good fortune of enjoying unseasonably warm weather over the past few weeks, and it has been fabulous. In fact, I even considered firing up the grill. Of course a brisk, windy day, along with temperatures in the single digits, set me straight. I went back to craving wintery comfort foods, and this Chunky Tortilla Soup with Black Beans is the epitome of wintery comfort food. It’s warm, a little spicy and filled with vegetables. From the original recipe, I used tomatoes with chiles, added more vegetables and increased the chili powder. This soup reheats beautifully, though over time the broth gets absorbed making it almost like a chili. I like it that way, but if you prefer your soup more soupy, I recommend adding some broth or water when reheating. Chunky Tortilla Soup with Black Beans is a healthy and delicious soup, and perfect to enjoy this winter! In a large Dutch oven, heat oil over medium heat. Cook onion for 5-7 minutes, until softened. Add garlic and chili powder and cook until fragrant (about 1 minute). Add tomatoes (with juice), beans, broth, spinach and corn; season with salt and pepper to taste. Bring soup to a boil; reduce to a simmer. Add tortilla chips, cook until softened, about 2 minutes. Remove from heat and stir in lime juice. Serve soup with lime wedges and more chips. Since last week ended up being pumpkin week, I thought it would be fun to give a nod to another fall classic this week – the apple. I enjoy an apple for lunch nearly every day and love using them in new recipes. This Apple Cheddar Frittata was new to us and will definitely be making a recurring appearance. The sweetness of the apple pairs beautifully with the sharp cheddar and the red onion balances nicely with the two. Preheat oven to 450 degrees with oven rack set to the top third. In a medium nonstick ovensafe pan sprayed with cooking spray, cook red onions over medium heat until softened (about 7 minutes). Put the onions in a separate bowl and set aside. In a medium bowl, whisk together the eggs, egg whites, 1/2 cup cheese, salt and pepper. Stir in onions. In the same pan used for the onions, heat butter over medium. Add egg mixture, and after 1 to 2 minutes once the eggs have set, arrange the apples on top in a circular pattern, starting from the outside edge. Sprinkle with remaining. Transfer skillet to oven. Bake until frittata is set in the center, about 20 minutes. Using a rubber spatula, release frittata from pan and transfer to a cutting board. Let sit for 5 minutes. Cut into wedges and serve. Chili and cornbread is such a classic combination. On Monday I shared a delicious Black Bean Chili with Roasted Butternut Squash with you. Today I am sharing with you this amazing Sweet Onion and Cheddar Cornbread that with our chili. Of course, while I have made several cornbread recipes over the years, cornbread with sweet onions and cheddar is a version I did not have a recipe for…until now. The first step in creating this recipe was to select a base, and for that I went to a very trusty source – the back of the cornmeal canister. Their Easy Corn Bread was a perfect place to begin. The rest was a little bit of guess work and crossed fingers. Sauteed onions and cheddar cheese are the perfect additions that take this basic cornbread recipe to a whole new level. The poppy seeds sprinkled on top add a little visual appeal. Mike has already requested I make this again. There is no doubt this Sweet Onion and Cheddar Cornbread will be making a regular appearance at our dinner table this chili season. Preheat oven to 400 degrees. Spray 9 inch baking pan with cooking spray. Heat olive oil in a medium skillet. Add onion and saute until softened (about 5-7 minutes). Reserve 1 tablespoon for topping. Set aside. In a large bowl, combine cornmeal, flour, sugar and baking powder. In a small bowl, whisk milk, oil and egg until combined. Add milk mixture to dry ingredients, mixing just until dry ingredients are moistened. Fold in onion and and cheese (do not over mix). Pour batter into prepared pan. Sprinkle reserved onion and cheese and poppy seeds on top. Bake for 20-25 minutes, or until a toothpick inserted in the center comes out clean. One of my favorite things about the fall season (aside from an abundance of pumpkin recipes) is chili. Not any chili will do, however…there are only a few chili recipes that I actually like. Each is as good as the next, and they all have one thing in common. They are vegetarian, and so delicious that you don’t miss the meat! This Black Bean Chili with Roasted Butternut Squash is a new recipe to add to my chili repertiore. It rivals my go-to recipe and then some. The butternut squash adds a little more work to this recipe, but it’s definitely worth it. I found some pre-cut cubes of butternut squash, which is what I used this time. It definintely cut down on prep time. But if you’re looking at a beautiful butternut squash and wondering what to do with it, I highly recommend trying this chili. Preheat oven to 400 degrees. Toss butternut squash cubes with olive oil. Spray a large, rimmed baking sheet with cooking spray. Transfer butternut squash to prepared baking sheet and spread out in a single layer. Roast, tossing occasionally, until just tender and golden brown (about 30 minutes). Heat oil in large pot over medium heat. Add onion and bell pepper, and cook, stirring frequently, until soft (about 5 minutes). Add garlic, stirring 1 minute. Stir in beans, broth, tomatoes, chipotle chiles, chili powder and oregano. Simmer, covered 10 minutes. Uncover and cook 10 more minutes. Stir squash into bean mixture and cook 5 minutes. Add salt and/or pepper, to taste. Serve warm. When I was flipping through a recent magazine for the second time, I was a little surprised to see that I flagged something called ‘Stovetop Chili Mac.’ It’s not something that I would typically make, based on title alone. After a quick glance, I could definitely see the potential in this dish – increase the veggies, give it some kick,…and we find ourselves with the delicious Spicy Beef and Zucchini Pasta. The beef and zucchini sauce was a spicy and flavorful topping on top of pasta, which is a nice change from your every day bolognese. The preparation of this sauce reminds me of my go-to taco recipe though. This recipe makes plenty, so enjoy pasta for dinner and then tacos for lunch the next day. That’s what we did! In a large pot of boiling water, cook pasta according to package instructions. Drain and return to pot. Meanwhile, in a large skillet, heat oil over medium. Add onion, peppers and garlic and cook until onion is translucent and peppers are soft (about 5 minutes). Increase heat to medium high, add beef and break it up with a wooden spoon. Cook until no longer pink. Add chili powder and cumin, and cook until fragrant (about 1 minute). Season with salt and pepper. Add zucchini and cook until tender. Add tomatoes, bring to a simmer and cook until mixture is thickened and heated through. Divide pasta among 4 bowls, top with meat sauce, and sprinkle with cheese.